New York, NY – (December 3, 2013): United Thinkers, a New-York based commercial open-source Payment Management Software provider, officially completed and certified payment gateway software integrations with Authorize.Net, NMI and TransFirst, extending the current number of available payment processor connections to 60. UniPay already offers numerous connections into payment processing platforms and banks in the US, Canada and Australia. Among them are various platforms of First Data, Vantiv, Litle, Paymentech, TSYS, Elavon, Global, American Express, Chase, SunTrust, Wells Fargo and others. “The Electronic Payment Management sector is developing at a rapid pace and more and more companies are emerging”, says United Thinkers President, Eugene Kipnis. “Our goal is to unify Payment Technology Standards to allow the processing of all types of credit card, bank account, and possibly digital currency transactions through a single unified API, not only in the US and Canada, but around the world”. One of the key advantages of the UniPay Platform, the company’s main product, is its processor-agnostic architecture. It allows merchants that want to support multiple merchant service providers at the same time to significantly simplify integration process and reduce infrastructural costs associated with the management of multiple integration end-points. UniPay Gateway is available under a commercial open-source license; Hosted offerings are also available through strategic partners of United Thinkers that already have the product deployed in their PCI Complaint Environments. In addition to the 60 connection points into various banks and payment processing networks, United Thinkers also offers tools for merchant management and on-boarding as well as split funding, tiered remittance, and custom statement functionality for PSPs. The UniPay Platform includes a sophisticated and robust recurring billing engine, supports both real-time and batch processing for both Credit Card and ACH transactions, providing cutting-edge features in combination with affordable pricing arrangements. You can contact Info@UnitedThinkers.com or Call (855) 643-7515 for more info. United Thinkers is an enterprise software development company that specializes in payment gateway technology development. 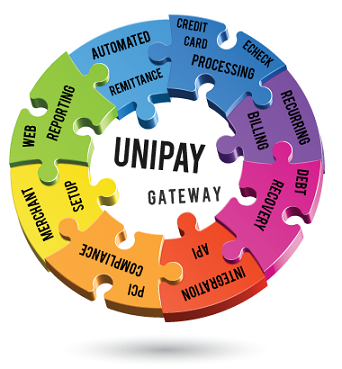 UniPay Gateway, the company’s flagship product, is an enterprise-scale cluster-ready commercial open-source payment processing solution, utilized by the industry’s leading third-party payment processors and payment service providers. Press Release: Authorize.Net, Network Merchants (NMI) and TransFirst Payment Gateway Integrations added to the UniPay Payment Management Platform.